Elizabeth Snyder, the wife of murdered St. Louis County police officer Blake Snyder, has been invited by President Donald Trump to attend his address to Congress on Tuesday. Snyder said she is honored to be invited to sit in House chambers and looks forward to what Trump will say about law enforcement, Fox 2 in St. Louis reported Monday. She posted about her excitement to attend about a week ago on Facebook, saying she hopes everyone watches the speech. Trump will address Congress on Tuesday in what is being termed an "address to a joint session" rather than a State of the Union speech. The president is expected to outline the goals of his administration. 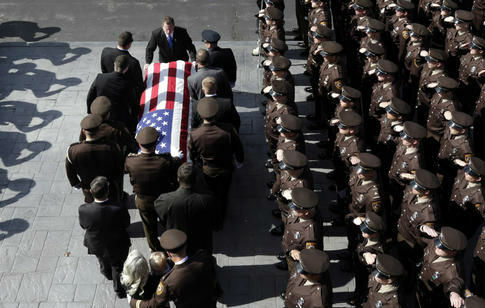 Snyder's husband was killed while responding to a disturbance call on the evening of Oct. 6. Police believe Blake Snyder was shot dead after he asked to see 18-year-old Trenton Forster's hands. He was rushed to the hospital but later succumbed to his injuries. After her husband's death, Elizabeth Snyder shared some letters that her husband wrote to her on social media, including one from the day of their wedding. "Today I marry my best friend, my everything, the love of my life, the one I've dreamed about for so long," the letter reads. "The fulfillment of God's purpose is complete and yet begins today." She also shared a video of her family and some photos from their wedding day. 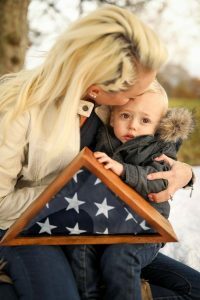 Snyder also posted a photo of her child touching a folded American flag honoring Officer Snyder. This entry was posted in Politics and tagged Congress, Donald Trump, Police. Bookmark the permalink.